On our ever-changing Earth, conditions may change quickly or slowly. Some changes come from natural processes; some from human activity. Satellites allow us to see conditions and track changes over time — in land use, forest health, land/water interface, and so on. Since 1972, Landsat satellites have been collecting data using various portions of the visible and invisible electromagnetic spectrum, at a scale close enough to see highways, but not individual buildings on a city block. Assigning different colors to different combinations of wavelengths allows us to see particular patterns more clearly. Geographic Information Systems (GIS) technology allows us to match locations, integrate data, conduct analyses, and show change from place to place or time to time. These tools allow us to monitor vegetation health, such as identifying areas of drought stress or insect damage. We can find changes in land use, such as expansion of urban areas into what was farmland or even desert. Climate change can be seen in the retreat of glaciers, or even shifts in coastlines of low-lying regions. By combining imagery data with other layers of information such as roads, population, or land ownership, GIS allows us to see trends and develop strategies for addressing issues. Geoscientists, foresters, water managers, and others in countless careers use GIS and its integrative nature to study and cope with issues of change. You can, too. Go to http://edcommunity.esri.com/esw for a series of lessons, including those depicted by these maps. 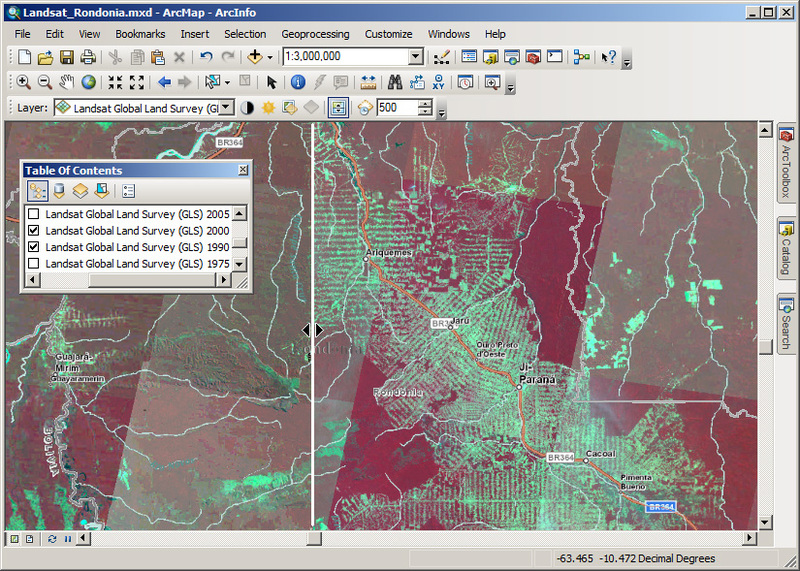 The site also includes pathways to free GIS software, online mapping sites, lessons, and other resources. 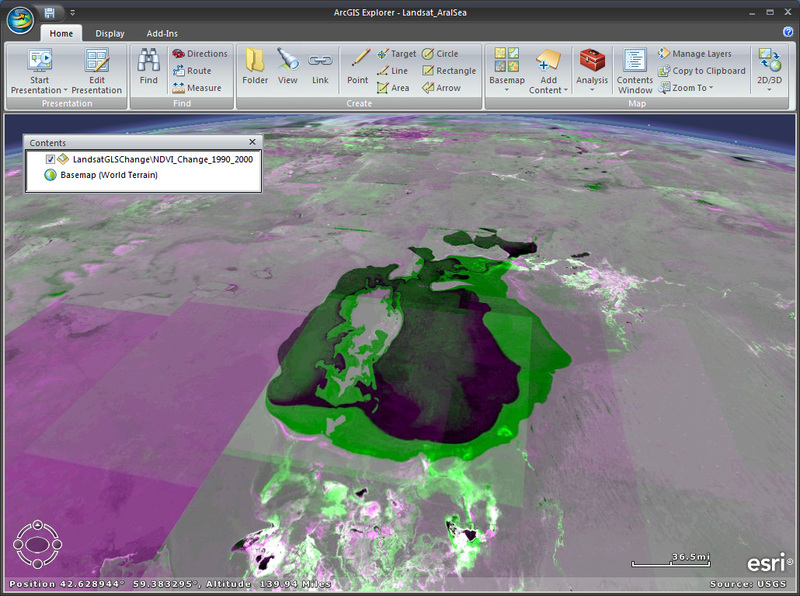 Help your students discover how Earth science and GIS support study of our ever-changing Earth. Change sometimes comes with a bang, such as the 1980 Mt. St. Helens eruption. 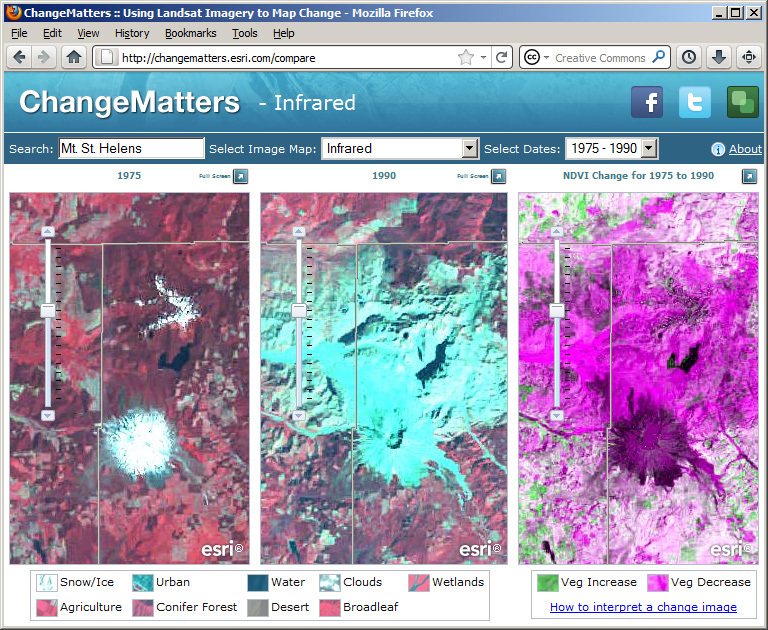 Compared with 1975 at left, the blue area in center (1990) shows scarred landscape, and magenta areas at right show vegetation decrease. The three-panel “ChangeMatters” application runs in any Web browser. Slow global change sometimes means rapid local change. 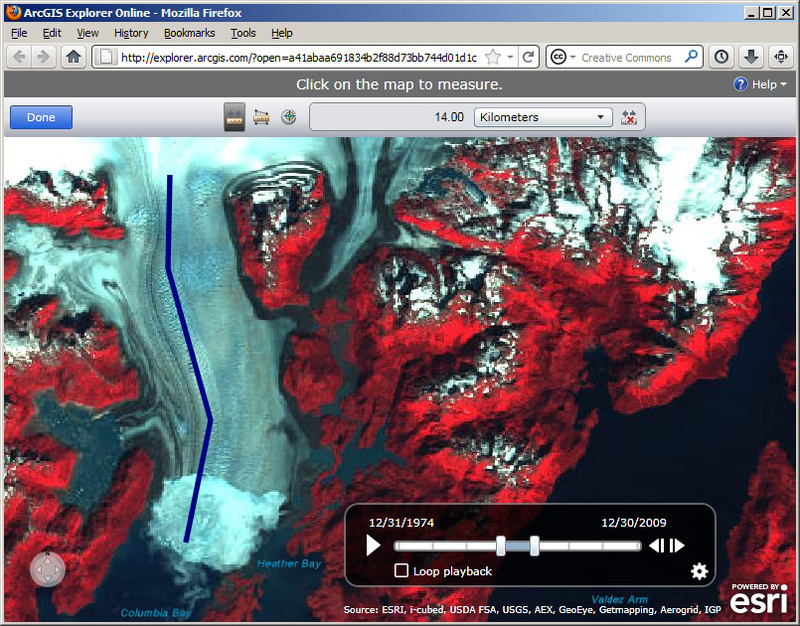 The Columbia Glacier in Alaska is receding quickly. The terminus recedes north along the blue line over 14 km between start and finish of this sequence, shown in ArcGIS Explorer Online. Lying between Kazakhstan and Uzbekistan, the Aral Sea was once one of the largest lakes in the world. Diversion of rivers for irrigation projects led to shrinking coastline, shown by increased vegetation (green) between 1990-2000, in this 3-D oblique view using ArcGIS Explorer. Time series data allows “swiping” between periods in ArcGIS Desktop. Just a few years can mean a big difference, as this “false color” combination of the Rondonia (Brazil) region shows, with healthy vegetation in red. Tree-cutting moved out from the roads and rivers. The north-south line separates 1990 (left) from 2000 (right).